INSULATION TESTED: 1-6 = BUSHING TERMINALS, G=GROUND Note: Circuit breaker open: bushing tests ( Test No. 1, 2, 3, 4, 5, 6). Circuit breaker closed: tank tests (Test No. 7, 8, and 9). INSULATION RATING: G=GOOD, D=DETERIORATED, I=INVESTIGATE,B=BAD, Q=QUESTIONABLE NOTE: No. in ENG column is bushing energized, in Tests 1 through 6, 10, 11 and 12. All other bushings must be floating. TEST EQUIPMENT USED: Serial Number: COPYRIGHT © 2002-2014 POWERDB, INC. COPYRIGHT © 2002-2014 POWERDB, INC.
TEST EQUIPMENT USED: COPYRIGHT © 2002-2014 POWERDB, INC. NOTE: No. in ENG column is bushing energized, all other bushings must be floating. Note: Subscripts are test no.s. Index may be positive or negative. BUSHING & OIL TESTS TEST NO. NOTE: Circuit breaker open: bushing tests ( Test No. 1, 2, 3, 4, 5, 6). 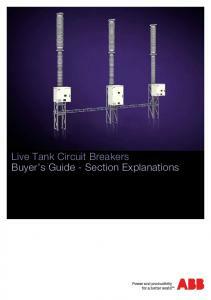 Circuit breaker closed: tank tests (Test No. 7, 8, and 9). NOTE: No. in ENG column is bushing energized in Tests 1 through 6, 10, 11 and 12. All other bushings must be floating. MULTIPLE QUICK TESTS TEST EQUIPMENT USED: Serial Number: COPYRIGHT © 2002-2014 POWERDB, INC. SETTINGS AS LEFT RATING PLUG(R) SENSOR TAP GRD. FLT. % D.F. - NORMAL % D.F. - REVERSE CALCULATED AVERAGE VOLTAGE MULTIPLIER % D.F. - MEASURED % D.F. @ 20 DEG. C.
Report "SF6 DEAD TANK CIRCUIT BREAKERS CAPACITANCE AND POWER FACTOR TESTS"